A small, single-frame cartoon in the Sunday Age a few years back always makes me chuckle when I think of it. Two blokes are surveying the Sunshine Marketplace shopping centre. I like it because it’s bloody funny. But I also like it because I like it that Sunshine Marketplace is like that. 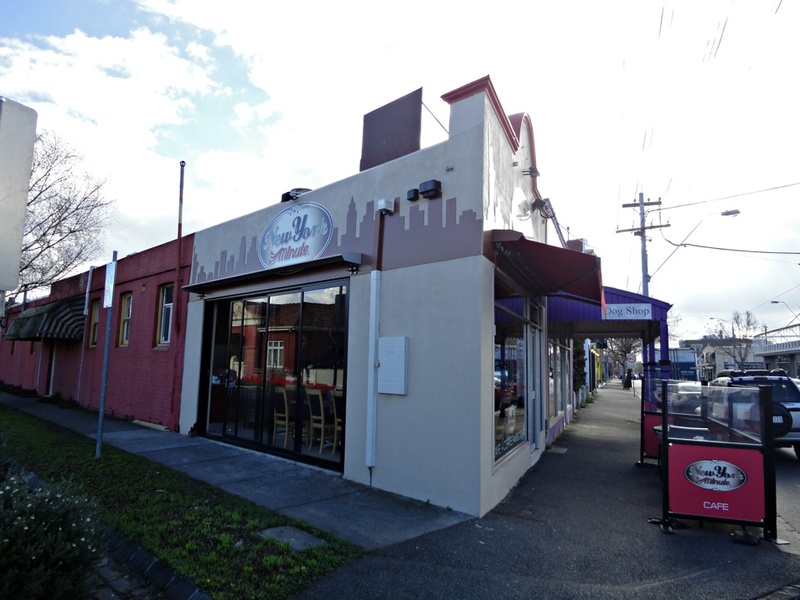 We may live in Yarraville, hit the new fried chicken place in WeFo as soon doing so is viable and even frequent hipster places in Footscray proper … but we love all the west and its people and food. Which is why CTS loves venturing to not only Sunshine, but also Werribee, Deer Park and beyond – and will continue to eat and review and tell stories from well beyond the ribbon that is the inner west. 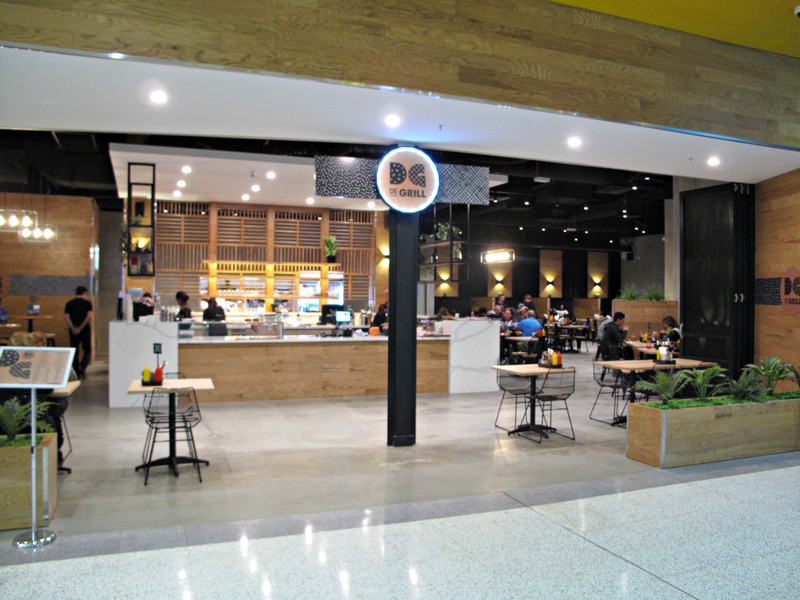 So we applaud the opening of DeGrill at Sunshine Marketplace. 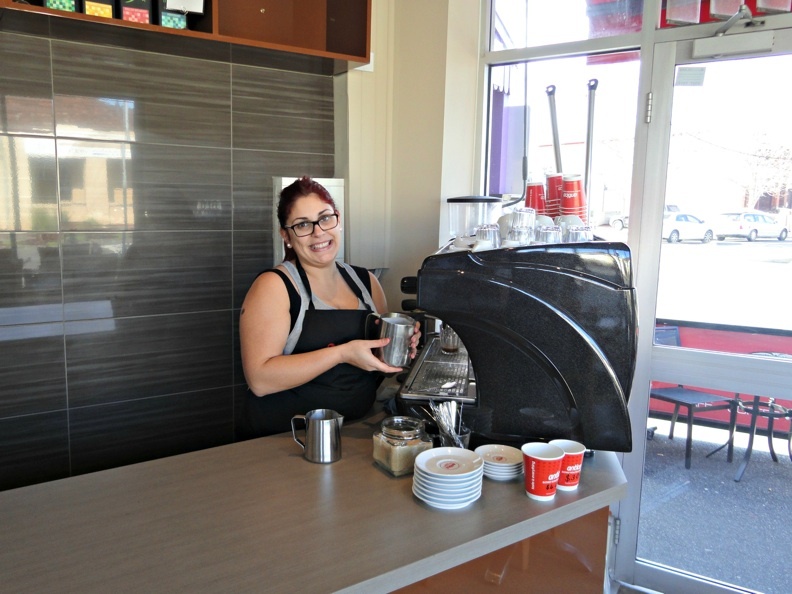 It’s a bold and adventurous move – it is situated, after all, right opposite Maccas and right next door to the cinemas. I could say that DeGrill is aiming for the same sort of focus as Grill’d or Nando’s – but that would be doing DeGrill a disservice. Because the menu is significantly more broad than such a comparison might imply. I suspect the menu may have to be tweaked over time to find out what really works in this particular setting. But over two visits, CTS and friends enjoy some good food and good service at (mostly) good prices. The style is classy fast food and proper cutlery and crockery are in use, as are fine salt and pepper grinders. There are three hot dog options on the menu, two featuring kransky or chorizo. 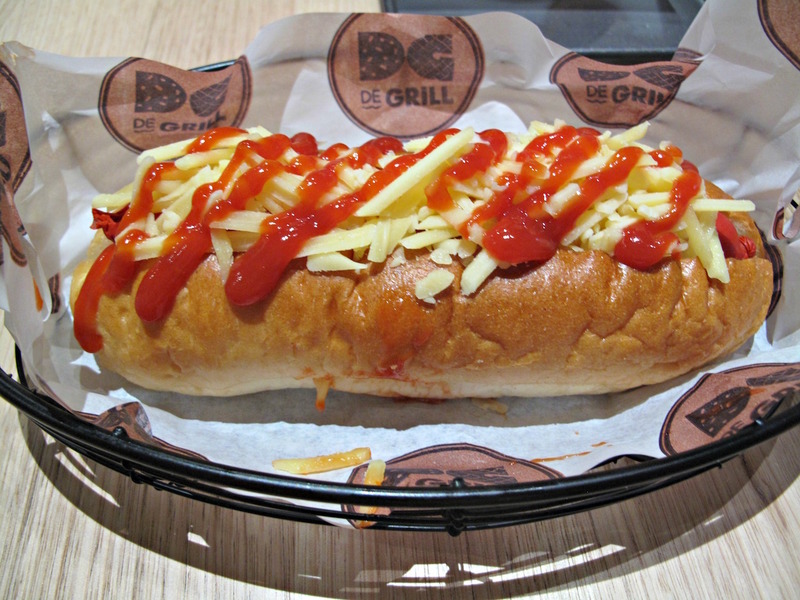 But the classic ($7.50) is constructed using a standard frankfurter. So all is regulation here, but its recipient is pleased enough. 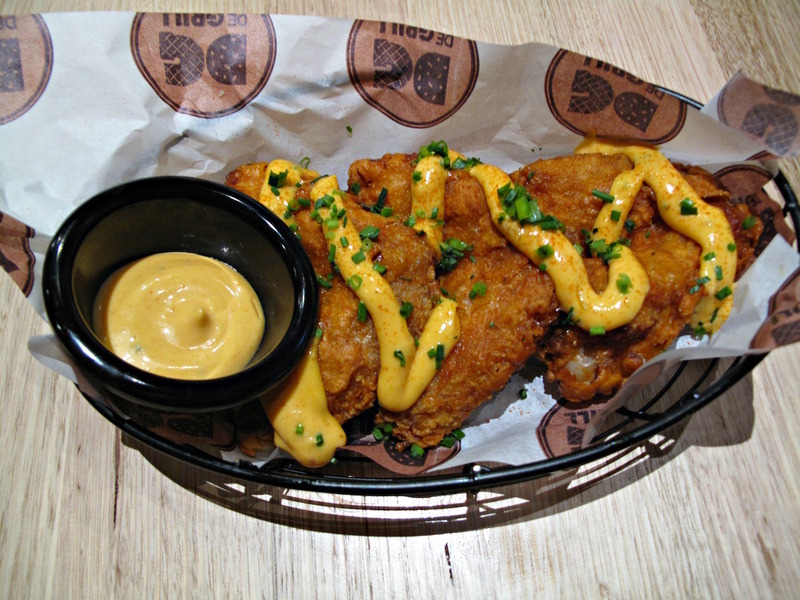 “Crispy” chicken ($9.50) has the wow factor aplenty. The serve consists of three superbly cooked wings anointed with a tangy sauce. … a side of mash and gravy ($6). This a rarity is Melbourne in general, let alone in a Sunshine shopping centre. It’s OK, we all like it – but it’s not spectacular. … the only marginally different philly cheese ($9.50), this may be the way to go here. Both are keenly priced and boast good ingredients and dressings. The steak is thicker than routinely found in steak sandwiches and, best of all, is so well cooked that biting through for a mouthful is done with ease and without the whole sandwich falling apart. Big thumbs up for that! Under the heading “from the grill”, DeGrill offers dishes such as a flat iron steak ($17 and $26) and chicken ($16 for half, $29 for full). These and others may fulfill the implied promise of more hefty meals. Sadly, the beef short ribs ($16) do not. It’s common knowledge ribs are expensive to secure and are inevitably at the upper end price-wise wherever they appear. It’s common knowledge, too, the beef ribs can be fatty. But these are very fatty indeed, and the three segments amount to not much more than a brief meal of not many more mouthfuls. 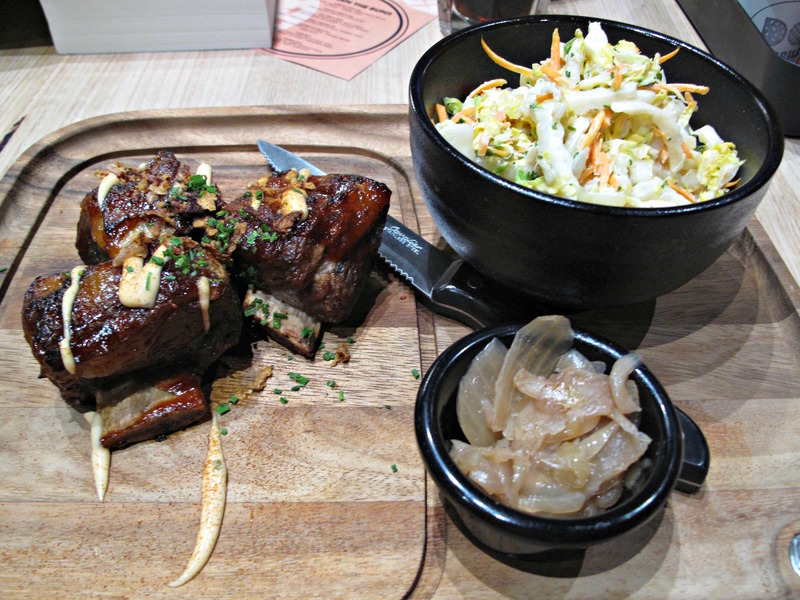 As well, as per the eatery’s name, these rib bits are grilled and not smoked, as you’d generally find at the numerous barbecue-style places across the city. The coleslaw ($4.50) lacks crunch – maybe because its main component is savoy cabbage? It’s under-done in the seasoning/flavour department, too, though some quick work with the salt and pepper grinders soon fixes that up. CTS is over the mega shake thing – too often they seem to involve poor quality ingredients and unjustifiably high prices. 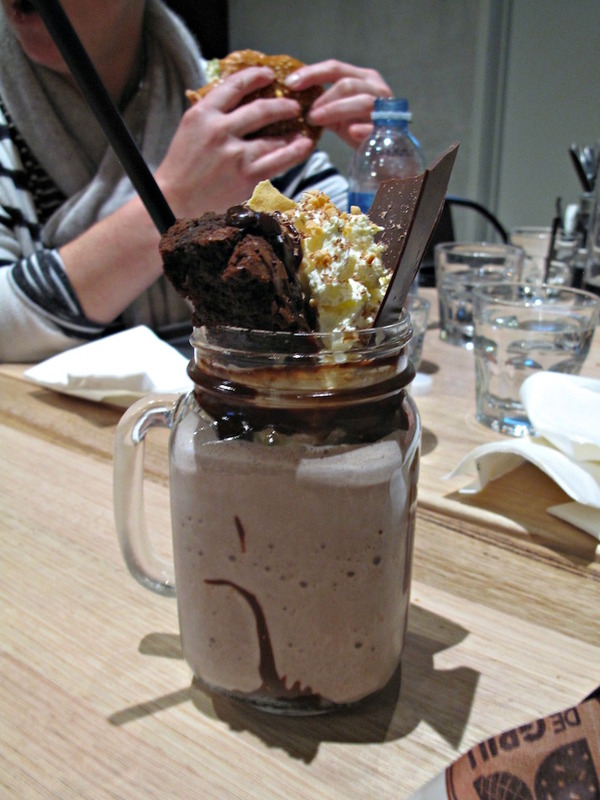 This DeGrill brownie shake ($9) defies both factors – good price, nice shake. Maye its arrival will inspire others to hang out their shingle in the same locale. Thanks to Annie and Ali for helping us with this story! Check out the DeGrill website – including full menu – here. Up this end of Collins Street, as well as there being some good lunch action going on in various laneways, there are also several swish food courts, all of which offer something interesting and good. Mason Dixon is tucked into one of them. They’ve been operating, IIRC, since about Christmas times and, by all accounts I’ve laid eyes on, are going gangbusters. I’m keen to check out their sangers in the company the Urban Ma, Jacqui, and her hubby, Wes. By the time Jacqui and I locate the joint following much confusion and consultation of device maps, the crowd is substantial – but Wes has been doing patient queue duty so our wait time is minimal. 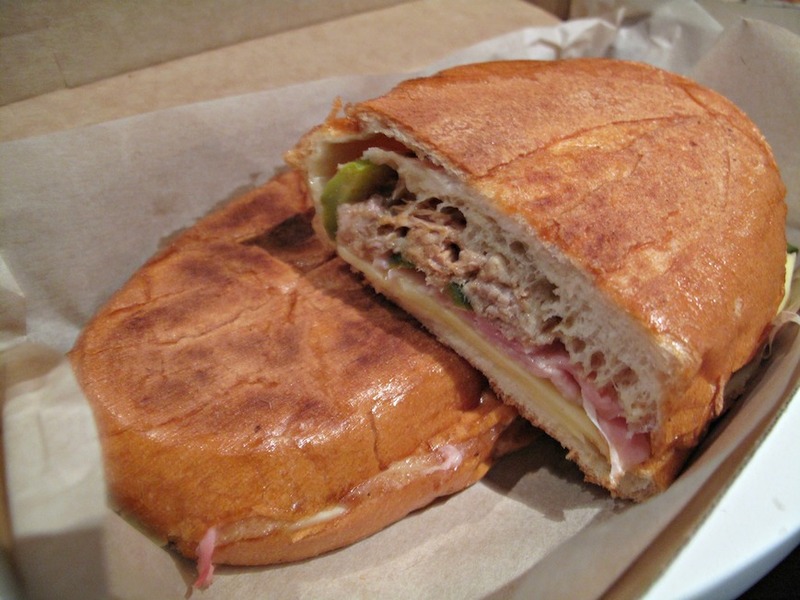 Two of us go the cubano (pictured at top, $9.50) of roast pork, smoked ham, dill pickle, swiss cheese and “citrus mojo” on a pressed roll. 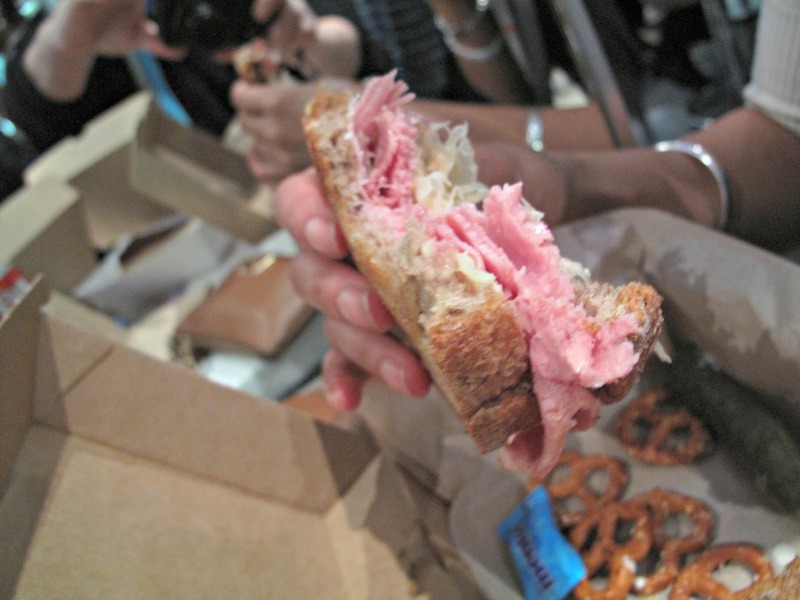 Our third sandwich is the reuben ($9.50) of corned beef, sauerkraut, swiss cheese and russian dressing. Both are served with a handful of mini-pretzels and a couple of plastic-wrapped Mentos. Both our sandwiches are good and constructed right for the $9.50 price tags. But there’s the rub … I do find both of them a bit bland and lacking in real oomph. But for the kind of sandwich dynamite for which I have been hoping, $15 would be a more likely price demand. And Mason Dixon, being pitched directly at the office lunch crowd, is nailing it in spades. Jacqui passes by the next day and subsequently reports the queue is nearly out the door and on to the street! If I our adjudge our sandwiches to have been slightly off target – for me anyway! 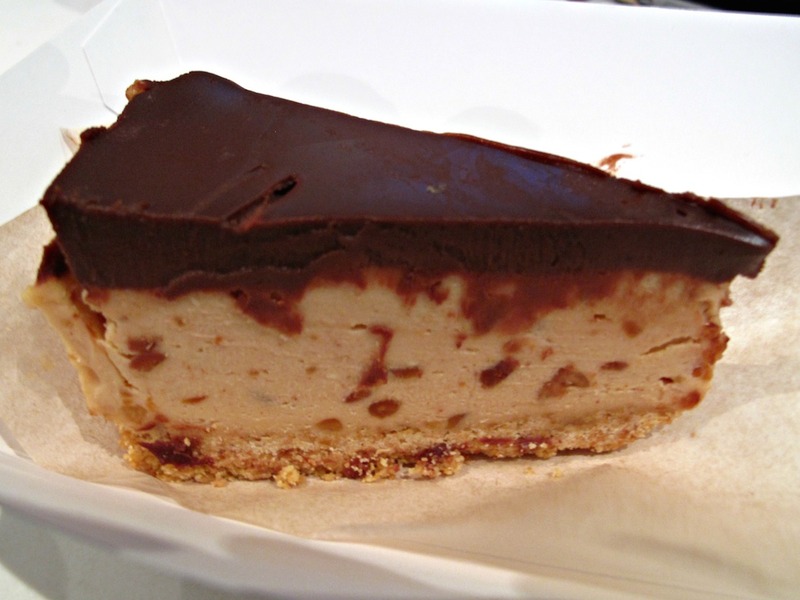 – the cheeky slice of peanut butter cheesecake ($5) Jac and I consume after Wes has split is a direct hit of glorious gooey richness. 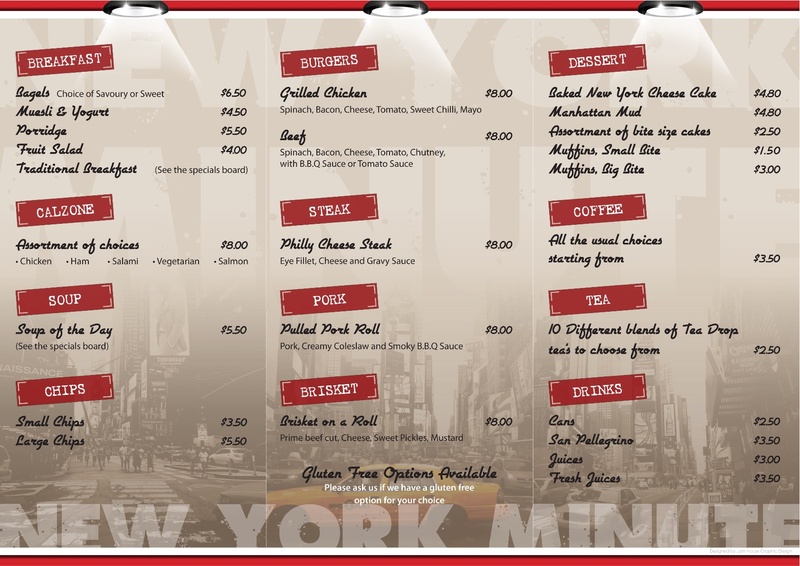 Just a couple of weeks after first visiting New York Minute, word is out that the full menu line-up is of offer. It’s time to return to check out their list of American-style sandwiches. Saturday lunchtime becomes a cheery social occasion, with yours truly joined by foodie-all-over-town Nat Stockley, Ms Baklover of Footscray Food Blog and her girls. 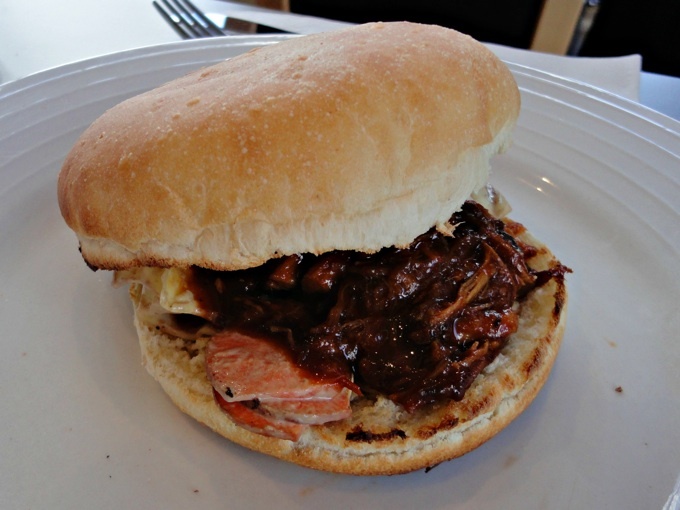 My Brisket On A Roll makes a nice lunch, but it’s not something I’ll order again. 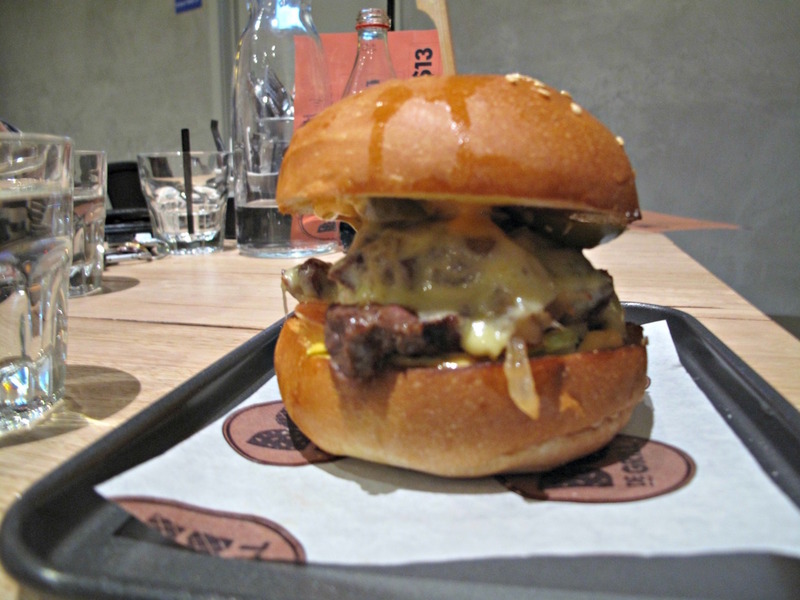 The cold beef is OK and accompanied by a Picalilli-style pickle; the advertised cheese seems to have made no appearance. The chips are something else again – and a big step up from that first visit, going from satisfactory to near-sensational. They’re hot, crispy but tender inside – it’s a good thing Ms Baklover relents and orders a big bowl for her brood, or we could’ve had a riot on our hands. She and Nat both order the Pulled Pork Roll with “creamy coleslaw and smoky BBQ sauce” (top photo). Their sandwiches look damn fine to me and I’m envious. But thy both mention a sweetness in the sauce that becomes tiresome as their meals unfold. The girls share the Philly Cheese Steak, which I foolishly don’t nail with a usable photograph. Somewhat to my surprise, as we are organising our departure, Ms Baklover opines that it has been the best of the lot; so that’ll be my lot next time out. 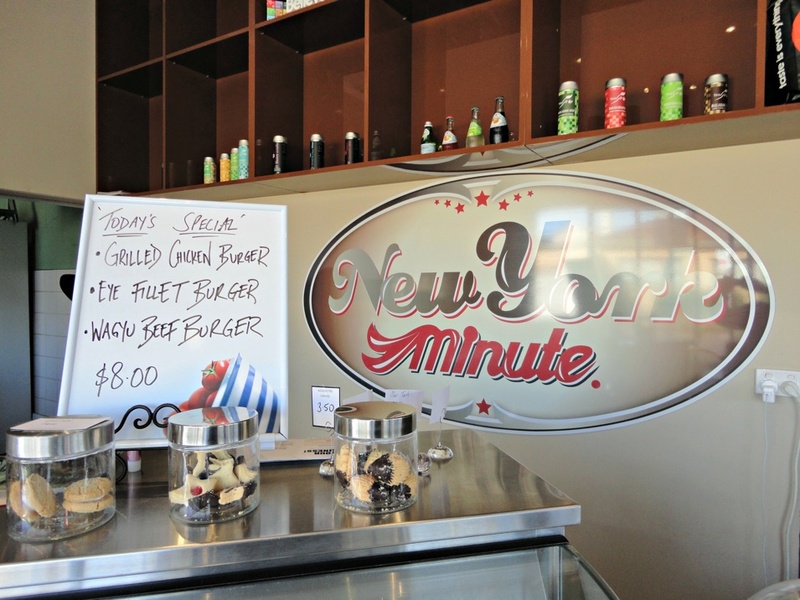 I suspect New York Minute may struggle to impress ardent and picky fans of such American-style sandwiches. But I’m not complaining after splitting while having paid a mere $14 for sandwich, terrific chips and a a full-size can of that Coca Cola stuff. See earlier story and menu here. Enjoying lunch at New York Minute is especially enjoyable, as only a week previously I’d ruminated on the fickle nature of this stretch of Mount Alexander Rd. So it’s nice to welcome a newcomer. Having been tipped off about this place – Hi, Nat! – and scoping out its website, I lose no time in getting up there. Because the New York Minute menu is so extremely well thought out – nothing over $8, very succinct but with several bases covered – and the fact it’s open breakfast, lunch and dinner seven days a week, it’s hard to see it becoming anything but a popular fixture. It’s a small place, but the brown-toned fit-out is cool and there’s outdoor seating. 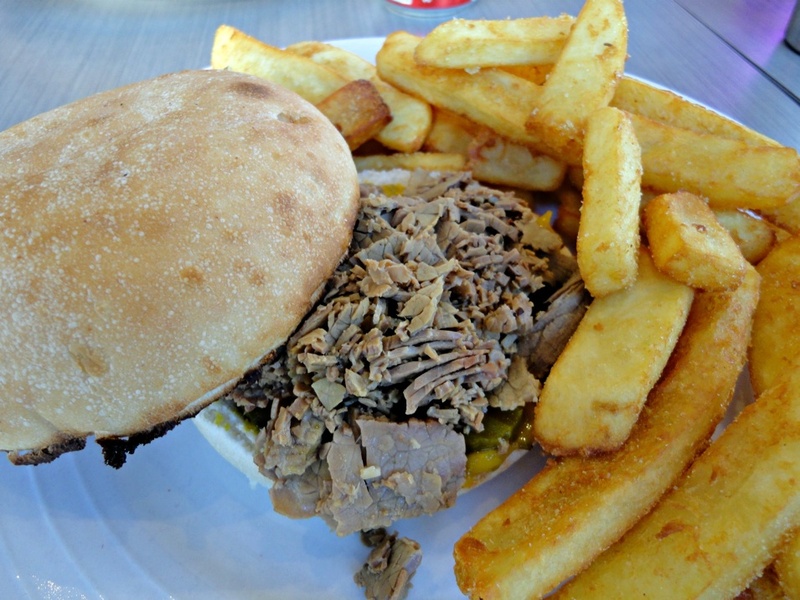 Unfortunately, as the place has been open only a few weeks, some of the sexier menu items are yet to eventuate – specifically the $8 Philly Cheese Steak, Pulled Pork Roll and Brisket On A Roll. The super friendly staff assure they’ll be up and running in a couple of weeks, but in the meantime I’m happy to make do with what’s available. A super homely and rich minestrone ($5) looks awesome, but I order the grilled chicken burger ($8) with a side of chips ($3) and a soft drink ($2.50 for a 200ml can). The chips are hot, delicious, just crunchy enough and just plentiful enough to accompany a burger. 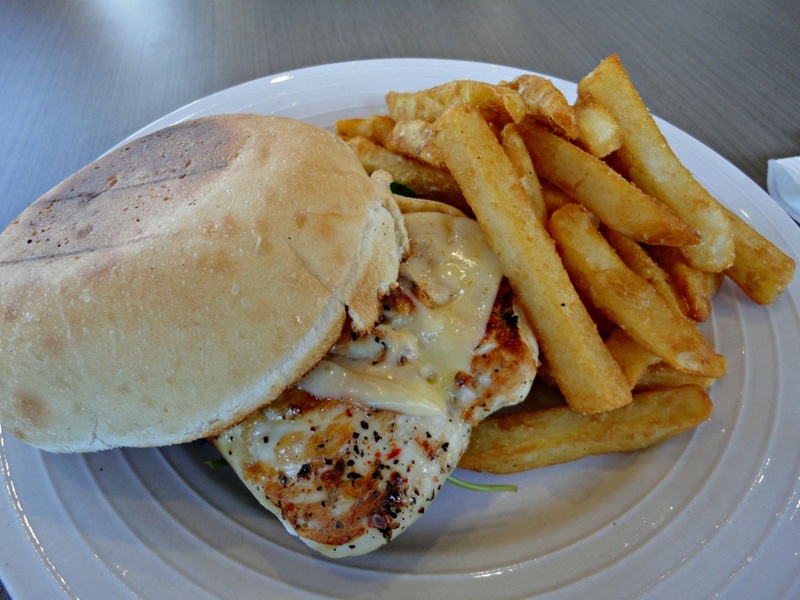 The chicken meat is tender and juicy, but lacking a little in the flavour department. Happily, the same can’t be said for the cheese. I’ve actually given up ordering cheese with any sort of burgers, as almost always it seems doing so is for form’s sake alone. How often can you actually taste the cheese? That ain’t the case here – the thickish slice of gooey, grilled Swiss is really good. The burger is completed with some good spinach leaves, tomato and chilli mayo. I linger long enough to enjoy a beautiful cafe latte ($3). Even with a slightly parsimonious soft drink serve, my lovely lunch is a brilliant steal at $16.50.